Scientific Name(s): Aesculus glabra Willd. Photographer(s) Appreciation: Another thank you to Stefano, aka douneika@Flickr, this time for his great photograph of Aesculus glabra. Aesculus glabra is most commonly known as the Ohio buckeye, but also goes by the names of American buckeye and fetid buckeye. As the common names suggest, it’s native to North America, significant to Ohio, and emits unpleasant odors! The Ohio buckeye grows mostly in the central-eastern United States, but reaches Canada (Ontario) at its northern range limit. These mid-sized trees are typically around 15m (50 ft.) tall with age. Typical of the genus Aesculus, the leaves are large and arranged as palmately-compound leaflets. 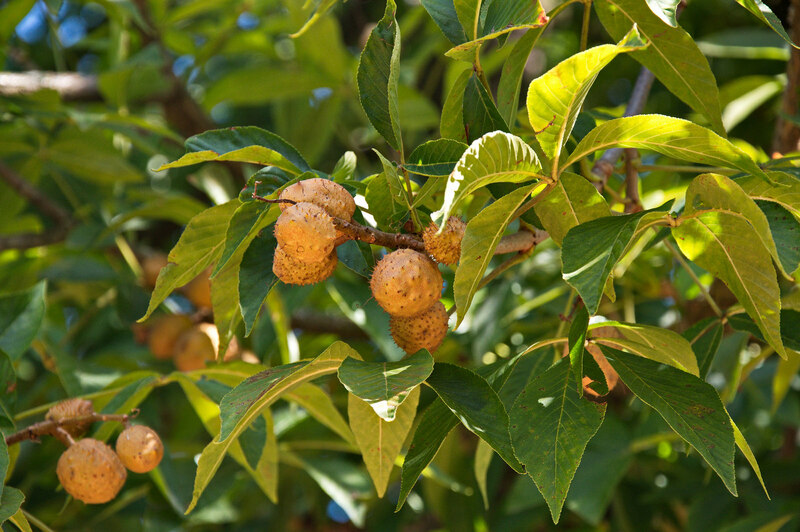 As shown in the photograph, the fruits are spherical capsules with a leathery husk. These contain glossy brown seeds. Probably its most noteworthy characteristic is that all of its parts are considered highly toxic if ingested, due to chemicals such as glycoside aesculin and saponin aescin (USDA (PDF)). Fetid odors are released by the plant when bruised or crushed; I imagine this reduces the appeal of tasting it, and thus lowers the chances of one being inadvertently poisoned by sampling. Its soft light wood has workable properties that finds it used to build artificial limbs, but the species is ultimately of minimal commercial importance. Aesculus consists of six species native to North America and at least seven native to Eurasia. The genus was named by Linnaeus after the Latin word for “edible acorns”, something seemingly unrelatable to species of Aesculus. The specific epithet signifies a smooth or glabrous surface, possibly referring to the leaves. Derivation of the common name is more obvious, referring to the pale scar on the seeds looking like a buck’s eye. This was originally coined by First Nations, who named the fruit “hetuck” meaning “eye of the buck. The term “buckeye” has cultural significance in Ohio, colloquially describing anyone from the state, and also being the official nickname for Ohio State University. Ohio is also home to Aesculus flava (yellow buckeye), which is known to hybridize with the Ohio buckeye, though the two generally grow on different substrates. Distribution of Buckeyes (Aesculus) in Ohio notes that Ohio buckeyes grow predominantly on formerly glaciated land or glaciated outwash almost exclusively in calcareous soils, while the yellow buckeye occurs only in some regions on the Unglaciated Allegheny Plateau in southeastern Ohio. In terms of its range in Canada, Aesculus glabra is believed to occur naturally only on Walpole Island in Ontario. Otherwise, populations are very small and possibly exist as the result of planted trees nearby. Located roughly 60km west and 80km north of the closest other Ohio buckeye populations, Walpole Island has long been occupied by First Nations. While the USDA considers it native to Ontario, an evaluation of this supposedly-natural growing Canadian population wasn’t able to determine if the trees growing on Walpole Island occurred naturally or were planted. They actually do well in Saskatoon as there are a number of them within the Saskatoon Forestry Farm Park and Zoo (formerly the Sutherland Forest Nursery Station 1913 – 1965) They are generally the first trees to show color in the fall and are usually a lovely red-orange-bronze. Most other prairie trees just turn various shades of yellow, if they turn at all, so these are wonderful to see. As an alumnus of The Ohio State University’s School of Environment and Natural Resources (then just the School of Natural Resource) and having initially majored in Plant Biology (then Botany), this will rank as one of my favorite BPOTDs. I actually have a number of Aesculus specimens on my property, including A. sylvatica, A. turbinata, A. pavia, and A. californica along with several hybrids. Much to my frustration, I’ve had difficulties getting an A. parviflora established. I’ve tried from seeds and from #1 nursery pots and failed each time (with the “help” of rodents). My experience is that Ohio Buckeyes typically turn yellow and sometimes bronze rather than to orange or red. It makes me wonder whether Claire is seeing the more commonly planted A. hippocastanum in Saskatoon. They are not easy to tell apart, as both have the spiked seed cases and are superficially very similar. I do have an A. glabra from Oregon’s Forest Farm nursery that does have red fall color, but it’s definitely an exception. I need to get that in the ground eventually, as I’ve had it in a #1 nursery pot for years. An interesting aside is that the genus generally has two common names applied, “buckeye” and “horse chestnut”. Properly applied, the former is reserved for North American species and the latter for their Eurasian counterparts. The phrase “conker tree” is more common for the Eurasian species grown in Britain, The game of conkers is still very popular with children and has its own World Championships, for the sake of charity. Our conkers are mostly A, hippocastanum but some gardens have A. indica and some councils have been planting the hybrid A. x carnea, a cross between A. hippocastanum and A. pavia, an American red buckeye. I planted an Aesculus glabra where I can see it from a window. It is doing well after nearly 10 years. I live in Oklahoma where it has been exposed to heat, drought, and ice storms. It performs admirably every year. The fall color is yellow, although some years there are not many leaves as they tend to drop early during our July- August drought. I like to save at least two seeds each year as they make excellent eyes for a snowman. Also, they must be happy here as a seedling has popped up in a nearby Hellebore bed.